Modern Interior style looks stylish with all its unique characteristics. The modern bedroom gives a jazzy look with its design and is decorated with beautiful paintings and wall art. Maximum people like the modern interior designs. Even though if you have small space or large space your interior can be designed modish. The colors are chosen which gives a rich look and the finishes of ceiling and flooring with a clean and glossy look. 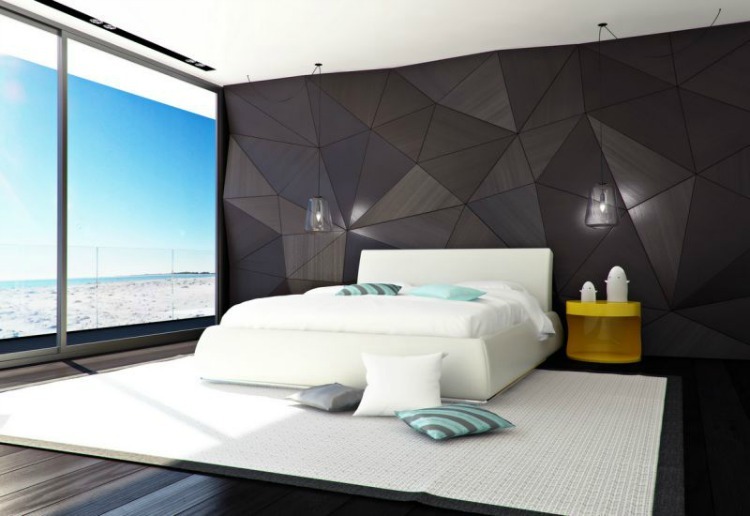 Here are few images of modern bedrooms which can be useful while designing your bedroom. A modern bedroom makes a great impression and reflects your personality. The entire room makes you feel pleasant. In the view of the image you can see a modern master bedroom. The interior s decorated with snowy white color and the false ceiling is dry wall ceiling with recessed lights. The flooring is made of concrete finish and has a beige plush carpet on it. The room has night stand with the lamps on it. The interior is decorated with wooden cladding which is modern and has an abstract painting mounted on it. The room has a kundalini chandelier attached to the roof and has couches with a centre table for seating and serving. The room has casement windows where we can view the outdoor. This image looks modish by the interior of modern master bedroom. The false ceiling is dry wall ceiling with Led pendant lamps attached to the roof. The flooring is made of dark wood tiles with a glossy finish. The interior is decorated with wall cladding and has a painting mounted on it. The room has a divan bed with headboard, quilt and cushions. The floor has smooth carpet and has a chaise for relaxing, reading a book or can even used for taking a nap on it. The room has casement windows where we can get sun rays refracted into the glass windows or can get reflected by covering it with thick valances. This image views you a modern master bedroom and his can be constructed near a sea shore where we can enjoy the beauty of seashore from the picture windows. The false ceiling is a dry wall ceiling with recessed lights and the flooring is made of dark oak wood and a smooth throw rug is laid on it. The interior is decorated with the wooden panelling which looks fabulous and creates a better mood. The pendant lights are attached to the roof and has a bed with snowy white quilt and cushions. The room has a foxy kontro signature leather bed which is stylish in look with a quilt and cushions. The false ceiling is a pop ceiling with a designed pattern and has a moon ball pendant light. The flooring has glossy ceramic tiles and has a light grey plush carpet on it. There is a television mounted on the wall for entertainment. It has chest of drawers for storing books and has panelling for placing display items. The room has a floor lamp and has picture windows for outdoor view. It is decorated with the blinds and are covered with sheer curtains. The room has indoor ornamental plants for fresh look. 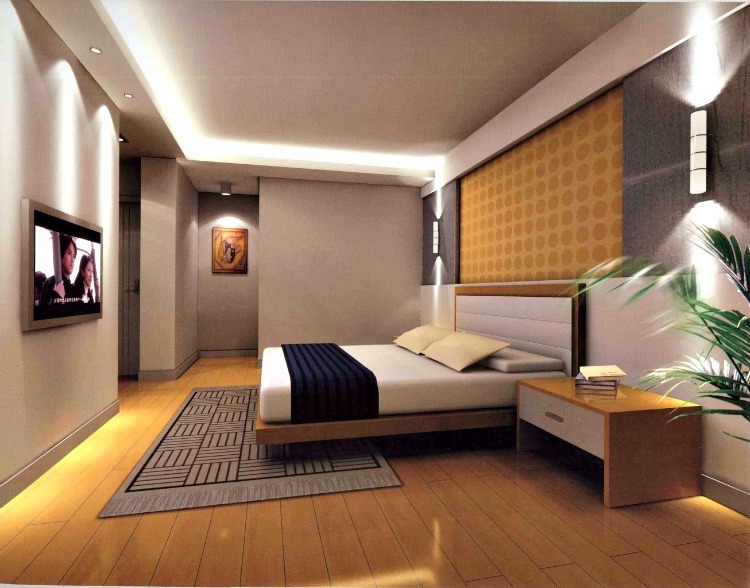 The interior design of modern master bedroom in the image has an elegant look. The false ceiling is dry wall ceiling with simple light fixtures mounted on it and string hanging lights attached to the roof. The room has a bed with cushions and coverlet. The flooring is made of wood and has a carpet on it. The interior has wooden wardrobes for clothing and for storing accessories. The room has wooden cladding attached to the wall, it has desk as a table with a chair. It has painting on the wall with a theme of beauty of nature. There are white framed windows covered with sheer curtains. The interior of this master bedroom has luxurious look. The false ceiling is pop ceiling with simple light fixtures and has a crystal chandelier attached to the roof. The room has wooden wall cladding and a television mounted on the panelling. It has night stand with lamp and floor lamp. The flooring is completely covered with velvet throw rug and has a tufted headboard with coverlet and cushions. The room has wooden wardrobe on which clothes and accessories can be stored. The room has chaise for relaxing and has even a leather bench. This image views a simple modern master bedroom and the false ceiling is dry wall ceiling with a milky white pendant light. The interior is decorated with ikea gallery and has closet in which books are stored, flower pots and display items are placed. The room has chest of drawers and has a bench. The interior has wooden ward robes for the clothes to hold in and the flooring is made of striped hard wood on which a brown textured plush carpet laid on it. The false ceiling is a dry wall ceiling with unseen lights and plain light fixtures. The interior of the room is decorated with golden yellow wallpaper and has wall sconce attached to the wall. The room has a night stand on which books are placed along with a chest of drawers for storing. The flooring is made of wood with a carpet. There is a bed with a wooden head board, navy blue duvet and cushions. It has a television mounted on the wall for entertainment and has photo frames. 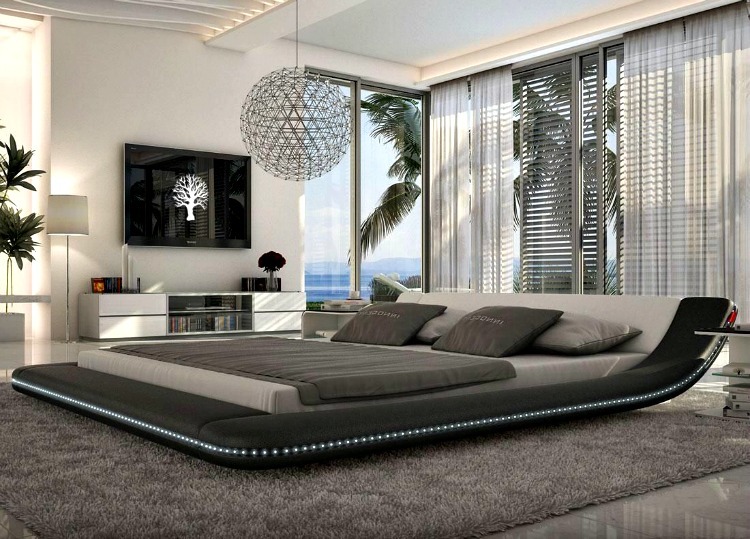 The interior of the modern master bedroom in the image looks classy. The room has decorated with dark wood wall cladding and has lights attached to it which gives a jazzy look. The false ceiling is a dry wall ceiling with recessed lights and has picture windows to view the beautiful outdoor and can be covered using draperies which gives a traditional look. The room has indoor ornamental horse tail reeds which gives a fresh look in the room. The flooring is made of plain vinyl flooring and has a plush carpet laid on it and the head board has night stands with the lamps on it. In the view of the image you can see a modern master bedroom. The interior is decorated with panelling and the bed has a leather head board with a quilt and cushions on it. The false ceiling is a dry wall ceiling with simple light fixtures and the flooring is laid of laminated hardwood and a modern throw rug placed on it. There are pendant lights attached to the roof and has picture windows to view beautiful outdoor garden. The room has chest of drawers for storing accessories.